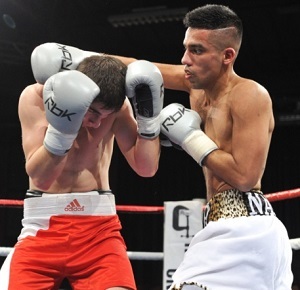 Uzair Najib is 5-0 with 2 KOs. Not every professional athlete is a millionaire. Some of them aren’t even hundred-thousand-aires. Some of them, in fact, still hold “regular” jobs in order to make a living until bigger paychecks roll in from their athletic endeavors. Uzair “The Nightmare” Najib is one of those athletes whose sport is not his only source of income. The 23-year-old Muslim super bantamweight boxer, who is taking his 5-0 record into this Saturday’s British Central Area championship match against 22-year-old (and fellow Muslim) Muheeb “Flashy” Fazeldin, works as a taxi driver when he’s not working on improving his fight game. In order to focus on training for this opportunity to win a title belt so early in his pro career, Najib said he’s taken a couple months off from his other job. He’s confident it will be a wise decision, as he believes he has the formula to beat Fazeldin, who is also undefeated at 5-0-1. A win this weekend would be a significant step forward in helping Najib achieve what is surely a goal of his — to quit one job and dedicate more of himself to becoming the next big thing in the ring.